1. 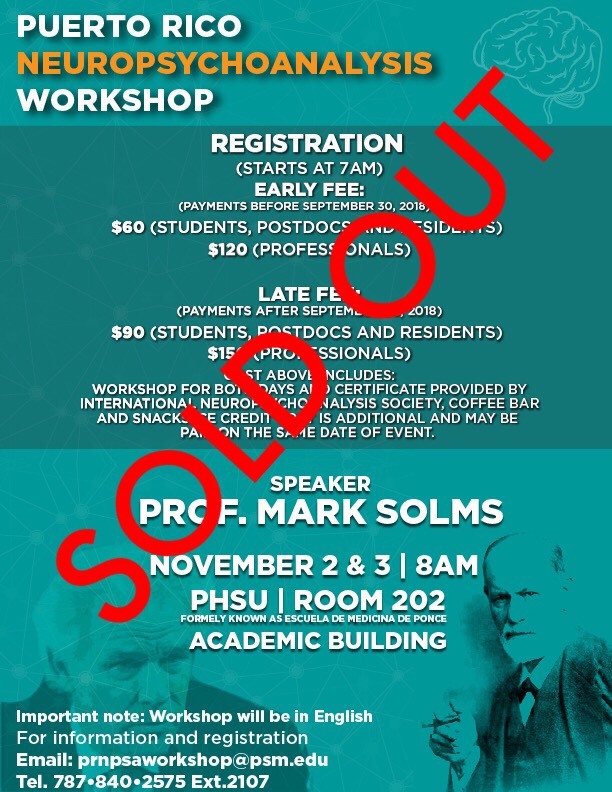 Complete the payment form that is available here and send it to PRNPSAworkshop@psm.edu (recommended). 2. Call 1(787)-840-2575; Ext. 2107 (from Monday to Friday from 8:00am – 12:00md, and 1:00pm – 4:30pm) and inform us that you are calling to complete the reservation process for the Puerto Rico Neuropsychoanalysis Workshop. If the person in charge (Linda Sanchez) is busy, the process may take time, which is why the first payment option is recommend. If you have any questions please contact PRNPSAworkshop@psm.edu or erios@psm.edu (Efrain Rios, coordinator). Please note that there are only 90 out of 200 spots available because a two-week grace period was provided for the people who RSVP’d and it is now open to everyone. Neuropsychoanalysis starts from the assumption that the brain and mind are the same thing, considered from two different observational perspectives (objective and subjective, respectively). This implies that everything we have learnt about the brain has implications for how we conceive the mind, and vice-versa. It is not scientifically acceptable to have two different and incompatible theories about the same part of nature. In this workshop, the two perspectives are reconciled with each other, and the practical implications for our clinical work as psychoanalysts and psychotherapists are discussed in detail. The first session discusses how basic psychoanalytic concepts can be translated into basic neuroscientific concepts and vice-versa. Then it focuses on one important respect in which the two sets of concepts cannot be easily translated, because they contradict each other. This contradiction concerns the fact that the part of the brain which performs the functions that Freud called the id is not unconscious, as Freud had claimed. In fact, it is the fount of all consciousness. The second session focuses on the parts of the brain that correlate with what Freud called the unconscious, and explains the implications for our understanding of this central psychoanalytic notion that arise from new findings about the functions of these parts of the brain (for example, the finding that the unconscious memory systems do not contain representational images). This culminates in a radical new conceptualization of repression. The third session outlines modern knowledge about the basic drives and instincts of the human brain, which requires substantial modification of Freudian ‘instinct theory’. This knowledge also has many important implications for our understanding (and classification) of various psychopathologies. The fourth session (first session of the second day) draws together the implications that the three innovations introduced on the first day have for the clinical practice of psychotherapy and psychoanalysis. The emphasis here falls on the implications of three important points: (1) the ‘talking cure’ cannot revolve around dragging the consciousness of words down into the unconscious id, thereby rendering it thinkable, since the id is in fact conscious from the outset; (2) the ‘talking cure’ also cannot revolve around the undoing of repressions for the reason that repressed unconscious memories cannot be recalled in the form of representational images; (3) the aims and mechanisms of psychotherapy and psychoanalysis are reformulated in the light of modern drive and instinct theory. The fifth and sixth sessions illustrate all of these clinical implications, especially for technique, with reference to two case presentations by members of the audience, discussed ‘live’ by Mark Solms. For further information about this workshop, please click here.